Are you going to IDEA2009? I am! And I want to meet you there. What follows is everything you need to know about the conference. I’m on the board of advisors for the Information Architecture Institute and have the utmost respect for the amazing folks who’ve put their blood, sweat and tears into organizing this year’s conference. It’s my pleasure to post the boilerplate here for you to read in case you haven’t seen the information on other sites and blogs. IDEA2009 runs September 15 and 16 in Toronto where the world’s foremost thinkers and practitioners will gather: sharing the big ideas that inspire, and practical solutions that improve the way people’s lives converge with technology. 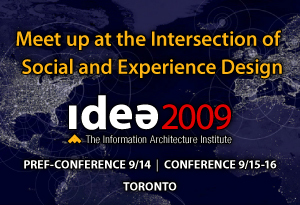 Whether you’re a designer, strategist, writer, UX professional, IA, or working in anything interactive, you should attend IDEA2009. You see it at Starbucks. People gather, but they don’t talk with each other. They communicate with their networked public. Facebook could be considered the fourth largest country in the world, yet it’s dwarfed by the over 300 million Chinese who use Qzone. IDEA2009 explores how to design these pervasive experiences. From the psychology to create more loyal users, to the design strategies and practices that bridge the physical and virtual world. This new world is already becoming a reality for your clients, employers, and customers. Luke Wroblewski – Director, Product Ideation & Design, Yahoo! Inc. Beyond the speakers, many of today’s brightest minds are attending and sharing what they know. In the intimate setting of the MaRS Innovation Centre, you’ll have the opportunity to exchange ideas and connect with leading practitioners from across the world. IDEA2009 presents the greatest combination of accessible industry leaders, valuable topics, and companies looking for professionals in the social and experience design space. You can talk directly to representatives from Critical Mass, Mad*Pow, Sapient, Usability Matters, Rosenfeld Media, and more. All the information you need to know about the program, speakers, and sponsors can be found at the IDEA2009 conference site. Hope to see you there! Hi! We are now mutually wanting to meet each other on Crowdvine (by the way, whoever thought to let attendees network preconference is a genius) but I will not be attending after all. I'm very sad to be missing it!